This blogger is amazing. I would recommend his blog to anyone. Twice exceptional refers to a person who is both gifted and learning disabled in one or more ways. Twice exceptional children are not often correctly identified in our schools and those who are discovered rarely have a place in school that provides what they need. Here’s an experiment for you…ask the next 10 people you meet what twice exceptional means. Chances are you’ll receive a few guesses and a lot of strange looks. 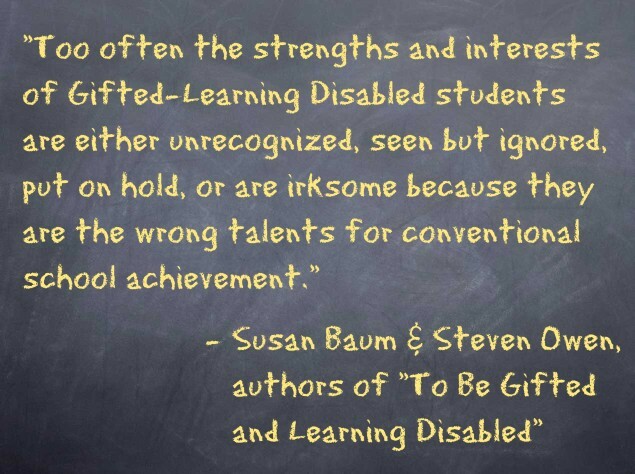 Now that’s not so hard to believe, but now try asking 10 teachers what twice exceptional means. The result will not be so very different from the random sample. In fact, I’ve met medical professionals who had not heard the term before. Heather, I just read this blog and it really hit home. Brooke is very smart but yet she has been diagnosed with ADD. The school said they wouldnt even test her because her grades in previous years have been straight a’s. Then I was told they wouldnt help her because the doctor says she doesnt need to be medicated at this point, to which I agree. After calling the school board they agreed to test her. The results came back that she did need extra help at this point, but…..then the teacher and principal have requested her to be retested because they dont agree with the results. So after 5 months we havent gotten any help for her and her grades are now suffering. A least I no longer feel alone in this. Thanks for sharing. I know what you mean. It’s the story of my own life – myself, not my kids, though to some extent it applies to Damon too. That’s why when I read this blog I had to “reblog” it. Click the link to Rochester Sage above the blackboard – this gentleman and his guest bloggers really understand gifted kids – more than the public school system ever will.